I feel a bit squicky when white authors write stories about people of color. That isn’t to say I don’t think it can (and should) be done, and done well; these are novelists we’re talking about, after all, versed in the art of becoming different people through their characters. Still, there’s a part of me that wonders how much research went into the writing, or how true the characters would sound to a person from the same cultural group. But if I trust anyone to present a different culture sensitively and honestly, it’s Vanessa Diffenbaugh. I read her debut novel, The Language of Flowers, when my husband and I were in the thick of foster parenting preparation, and I was both surprised and pleased at how much she got right about what it’s like for kids who age out of the system. I tend to avoid fiction with foster/adoption themes because it’s so often either demonized or romanticized (each offensive in its own way), but Diffenbaugh is clearly committed to realism and empathy in equal measure. 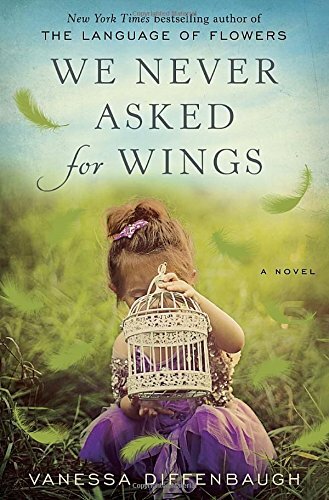 From what I have learned about immigrant life in the US, both documented and undocumented, Diffenbaugh gets a lot right in We Never Asked for Wings as well. Anyway, here's the setup: Letty has been a mother in a biological sense for fifteen years, but she forfeited most of her motherly responsibilities to her own mother, who cared for Letty’s son and daughter while Letty worked to support the family. As the book opens, that arrangement comes to a sudden end, and Letty has to step up and learn how to be a real mom to her kids. Her newly redefined parenting role isn’t an easy fit for Letty, but that’s due mostly to her own hang-ups, because her kids float close to too-good-to-be-true territory. Fifteen-year-old Alex is a bright, try-hard student who, thanks to his grandfather, is fascinated by science. His younger sister Luna is fairly typical for six—boisterous, insistent, and hard to keep busy. Letty doesn’t need to worry too much about other kids being a bad influence on hers—if anything, she’s the bad influence, going for the path of least resistance whenever possible. But I still found myself rooting for her, or at least for the family in general, especially when things got complicated in the second half of the book. Diffenbaugh has shown herself to be a writer who cares about complex, real-world issues. After foster care and immigration, it will be interesting to see where she turns her sights next. With regards to Ballantine Books and NetGalley for the advance copy. On sale August 18.